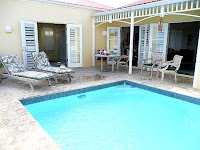 St Croix Rent A Villa announces more Good News... and if you needed another reason to make plans to visit St. Croix...we've just made it easier! LIME TREE is offering a $500 SAVINGS off regular rates if you reserve by September 30 and plan to vacation by Dec. 12, 2009. This is a special time limited offer so please hurry and reserve your choice vacation week now at this very upscale villa with it's views and private pool ambiance. 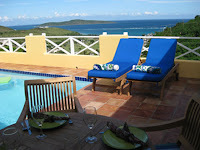 C'mon... CARIBBEAN ESCAPE ~ Rent A Villa! WOW ~ RECESSION BUSTER FARES AT CARIBE...this beautiful villa with private pool, views and loaded with amenities and island ambiance has just announced FANTASTIC LOWER RATES ....$1000 wk/2 guests and $1250 wk/4 guests. Reserve any open week up to Dec. 15. The catch? All reservations must be made by Aug. 30th...C'mon, grab your dates and enjoy this one time opportunity to experience a prestigious Villa Madeleine villa at unbelievable low rates!